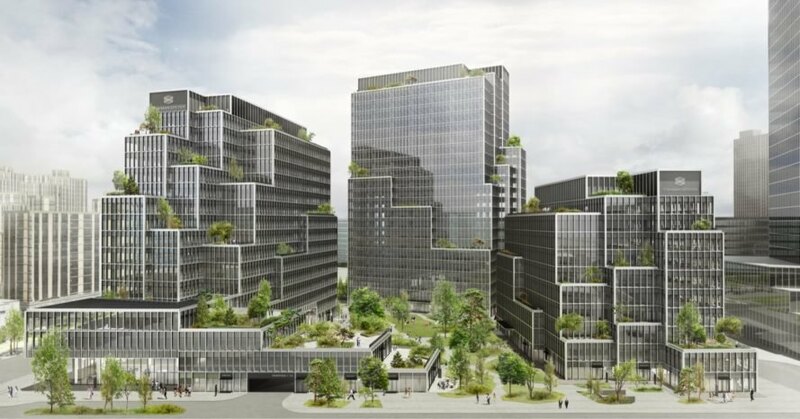 Henning Larsen Architects — in collaboration with landscape architects SLA — has unveiled designs for the first phase of the “The Springs,” a mixed-use development currently underway in Shanghai that aims to embrace green living. Inspired by a style of traditional Chinese landscape painting called ‘shan shui,’ the Danish architecture firm crafted the buildings in the image of the dramatic, mountainous landscapes found throughout rural China. Trees and gardens will grow on top and around the stepped towers to create an immersive urban oasis of green. 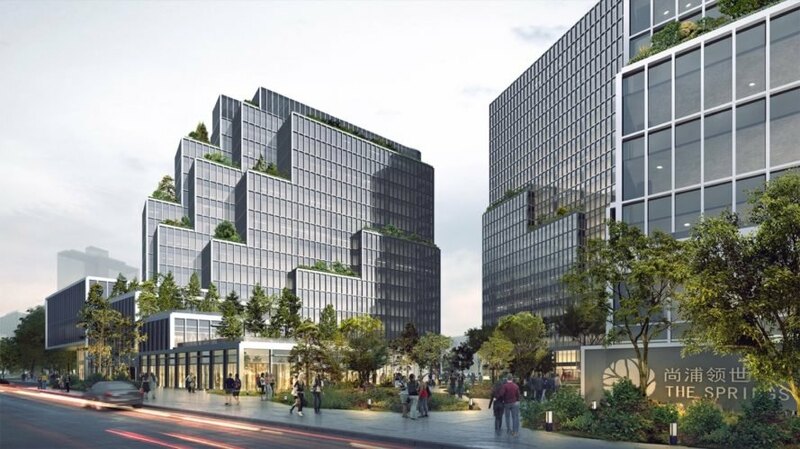 Developed for real estate company Tishman Speyer, The Springs is located on a 66-acre plot in Shanghai’s Yangpu district and will incorporate a mix of residential, commercial and retail. 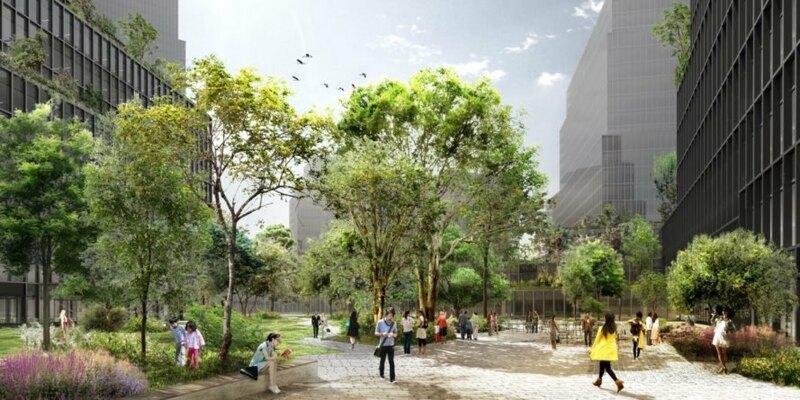 With a proposed 40 percent green ratio and a 33-acre wetland eco-park next door, the planned development embraces green living in both its surroundings and its design. At its core, Henning Larsen designed a series of terraced high-rises layered with greenery and clustered around a green public square to create a sheltered microclimate for improving air quality, reducing noise pollution and promoting natural light. According to Tishman Speyer, The Springs will feature LEED Gold certification for the Core & Shell of the first phase. Public health will be promoted through a pedestrian-friendly design that boasts abundant open space and excellent transportation infrastructure.The Springs development broke ground July 12, 2018 and is slated for completion in 2020. Henning Larsen recently unveiled designs of The Springs. 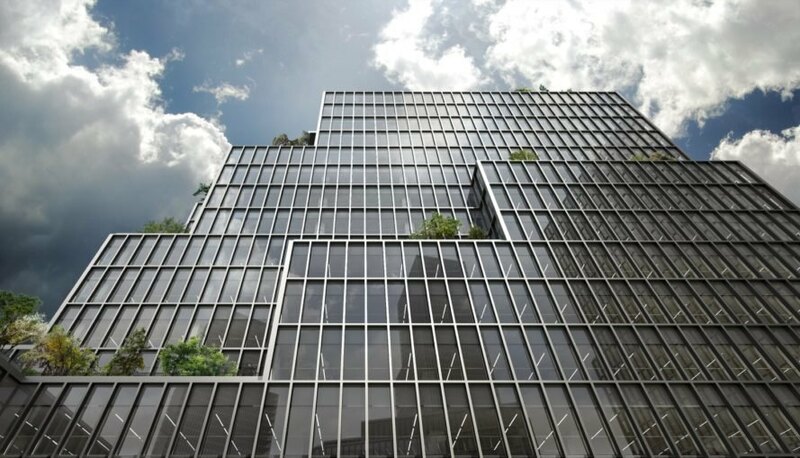 The sustainable structures are designed for mixed-use development and green living. The Springs incorporates plenty of lush greenery into the city. The towers are positioned to improve air quality, reduce noise pollution and promote natural light. The project broke ground in July 2018 and is expected to be completed in 2020.